How would your skin feel if you smeared it with petroleum jelly and stood in the sun for a few minutes? It would probably feel sweaty and uncomfortable. That is because your skin is dotted with small opening called pores that allow your body to perspire. Block the pores and water stays trapped inside your body. Plants have small opening in their tissues called stomata. Moisture evaporates, or transpires, through a plant's stomata. 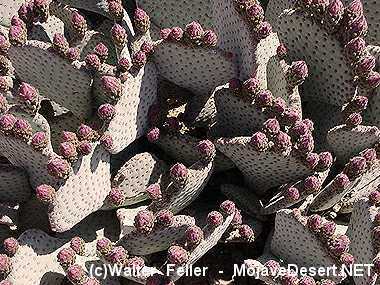 Some desert plants have an oily coating on thier leaves or pads that traps moisture, thereby reducing water loss. On a hot day, would you rather bewearing a white t-shirt or a black t-shirt? You probably answered, "White t-shirt." White is a good reflector of the sun whereas black absorbs solar heat. Many desert plants have light-colored spines, hairs, or leaves that act as heat reflectors, though on a very small scale. Fine hairs covering the leaves of many desert plants trap moisture as well as reflect sunlight. Q: When is an umbrella not an umbrella? A: When it is carried on a sunny, cloudless day to shield its user from the sun, not from rain. Then it is called a "parasol." 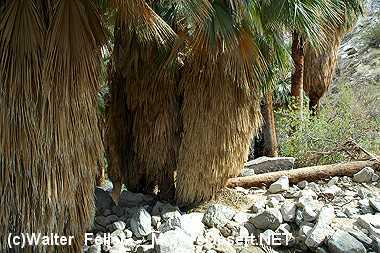 Some desert plants use their spines and leaves as parasols to create pockets of shade. Look closely at a cholla cactus. Its spines are arranged in such a way that the branches of the cactus are shaded from the sun's intense rays. Dead leaves lying against a Joshua tree trunk perform the same function. They create a layer of shade. Imagine an accordion. When you pull it apart, it expands and pulls in air. Push it together and the air is forced out, creating music. In a similar way, some desert plants can balloon and shrink depending on the availability of water. When it rains in the desert, these plants can increase as much as 50 percent through water absorption. In drought periods, these desert sponges gradually shrink as they use their internal water to help them survive. 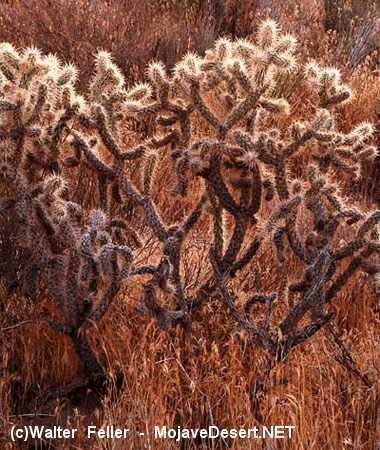 A cholla cactus provides shade for itself. Notice the abundance of lighter-colored, newer, spines at the top of the cactus. This busy beavertail cactus has stored considerable water and is putting much of it into blossoms ensuring survival. When times are dry, the now plump pads will shrivel and wither. The waxy, broad, leaves of the California Fan Palm provide shade for the trunk helping to conserve water.